Be the first to share your favorite memory, photo or story of Billy "Bubba". This memorial page is dedicated for family, friends and future generations to celebrate the life of their loved one. 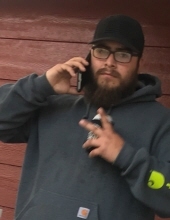 Billy “Bubba” Roy Benavides, II, a resident of New Braunfels, passed away in New Braunfels unexpectedly on Saturday afternoon, March 23, 2019 at the age of 24. Billy was born on June 14, 1994 in Waxahachie, TX to Billy Roy Benavides and Amy Vasquez Benavides. Billy, better known as Bubba, served his country proudly in the United States Marine Corps. He was later employed as a hand with Hydro Resources in the water well drilling business. Billy attended elementary and junior high in Italy, TX and high school at Canyon Lake High School. Known for having a huge heart and the propensity to stir up trouble, Bubba's sense of humor will be missed by all. Survivors include his father, Billy and Tracy Benavides; mother, Amy Benavides; siblings, Taylor Benavides, Haley Benavides and spouse, Alessandra and Presley Benavides; niece, Sadie Hamrick; grandparents, Al Miller, Rebecca Benavidez, Mike and Nancy Benavides. In addition, “Bubba” is survived by his girlfriend, Taylor Durbin and children, Cooper and Bristol Durbin and many aunts, uncles, cousins and friends. A graveside service with full military honors is scheduled for 9:45 AM on Friday, April 5, 2019 at Fort Sam Houston National Cemetery at shelter #5. Family and friends are invited to stop by the Phoenix Saloon in New Braunfels, TX following the service to celebrate Bubba's life and share memories with the family. In lieu of flowers, the family recommends donations to the Chris Kyle Frog Foundation. To send flowers or a remembrance gift to the family of Billy "Bubba" Roy Benavides, II, please visit our Tribute Store. Full military honors. Shelter #5. "Email Address" would like to share the life celebration of Billy "Bubba" Roy Benavides, II. Click on the "link" to go to share a favorite memory or leave a condolence message for the family.